Hopi Prophecies of the End of the Current World/Cycle. "World War III will be started by those peoples who first revealed the light (the divine wisdom or intelligence) in the other old countries ( India , China , Islamic Nations, Africa ). The United States will be destroyed, land and people, by atomic bombs and radioactivity. Only the Hopis and their homeland will be preserved as an oasis to which refugees will flee. Bomb shelters are a fallacy. "It is only materialistic people who seek to make shelters. Those who are at peace in their hearts already are in the great shelter of life. There is no shelter for evil. Those who take no part in the making of world division by ideology are ready to resume life in another world, be they Black, White, Red, or Yellow race. They are all one, brothers. The circle with the four O's and cross within symbolizes the Four Corners Region (where Utah , Colorado , Arizona and New Mexico meet). The circle represents no beginning and no end -- the infinite Great Spirit. The Indians believe we are the Fourth World . When the Third World was destroyed, those Indians who had listened to the prophets were guided to places of safety underground. After the Fourth World was created, they assembled at Four Corners and were instructed to spread out in the four directions. Four (4) also represents the four elements in nature: fire, water, air and earth; and the four color races of man: black, yellow, white, and red. In the Hopi Prophecy, a white man would come to them and help transform the entire continent into a spiritual paradise. He would be recognized because he would carry the fragment of stone which would complete their Holy Stone, filled with Indian writing characters. The Holy Stone had been preserved for thousands of years. Thus, when the white settlers came to the American continent, remembering their prophecy, they were openly welcomed. The Indians shared all they had. In return, all the White Man did was to take. The Indians noticed that their White Brothers had brought a cross. However, it was not enclosed by the circle of the Great Spirit, thus showing the White Man had lost his way. The Indians believe that at the beginning of the Fourth World , when man was told to disburse throughout the planet, from Four Corners , the White Race was one of the original races that went East. Upon their return to our continent, they had become confused and forgotten the ways of the Great Spirit. Further the prophecy continued, either the White Man would bring peace and harmony or attempt to totally destroy the Indians' way of life and take all their possessions and the land. If the latter occurred , there would come a time when the Indian people would appear to be almost nonexistent. Yet, one day, they would rise out of nowhere to lead a spiritual revolution so that all people on this continent would become attuned to the Great Spirit and to protect Four Corners at all costs because there is great power under the land. If it is allowed to escape, great destruction will result. Today, the Indians are going through the test to hold onto their traditional ways and protect the land. The White Man's society is trying to swallow the Indians up. Many Indians, especially the young, are falling prey to the White Man's ways. The prophecy also talks about creation of atomic bombs as catastrophes of great heat, equal to the heat of a sun. It also warns about tampering with the moon (violating its nature by removing rocks and soil). Another prophecy: Four Corners will be area of confrontation between White and Red. Indians will be pushed into Four Corners . Great Spirit told the Hopi that Four Corners is the backbone of what is now the United States . Hopi must hold this land till human beings live in harmony. The power under the land would be used for destruction. There would be a terrible punishment if we give up Four Corners . 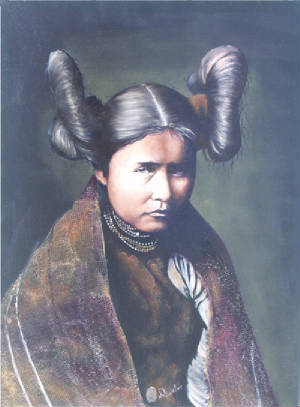 Hopi Elders also know about the prophecies of earth changes and Space Brothers. Hopi elder Thomas Banyacya has written, "Our true white brother, when he comes, will be all powerful and he will wear a red cap and cloak. He will be large in population and belong to no other religion than his very own. He will bring with him the sacred stone tablets. Great will be his coming. None will be able to stand against him." Although it is unclear whether Pahana will hold the stone tablets in a literal or a symbolic sense, this passage indicates that he is not a single person, but large in population. Because Tibetan rinpoches and lamas wear red, and because Tibetan Buddhism has rituals similar to Hopi ones, especially the making of sand paintings as a healing and a tool for meditation, many wonder whether Pahana could be represented, in part, by the arrival of the Tibetan spiritual community. And traditional Hopi, in recent years, have initiated meetings with Tibetan holy men to explore this possibility. "And now White Feather is dying. His sons have all joined his ancestors, and soon he too shall be with them. But there is no one left, no one to recite and pass on the ancient wisdom. My people have tired of the old ways -- the great ceremonies that tell of our origins, of our emergence into the Fourth World , are almost all abandoned, forgotten, yet even this has been foretold. The time grows short. The Emergence to the future Fifth World has begun. It is being made by the humble people of little nations, tribes, and racial minorities. "You can read this in the earth itself. Plant forms from previous worlds are beginning to spring up as seeds. This could start a new study of botany if people were wise enough to read them. The same kinds of seeds are being planted in the sky as stars. The same kinds of seeds are being planted in our hearts. All these are the same, depending how you look at them. That is what makes the Emergence to the next, Fifth World. The Great Chieftain of the Bow Clan led the faithful ones to this new land, but he fell into evil ways. His two sons scolded him for his mistake, and after he died they assumed the responsibilities of leadership. Each brother was given a set of Tiponi, and both were instructed to carry them to a place to which the Great Spirit directed them. The elder brother [of the shining light] was told to go immediately to the east, toward the rising sun, and upon reaching his destination to start back immediately to look for his younger brother, who remained on Turtle Island [ North America ]. His mission was to help his younger brother to bring about the Purification Day, at which time all evildoers would be punished or destroyed, after which real peace, brotherhood, and everlasting life would be established. The elder brother would restore all land to his younger brother, from whom the Evil one among the white men had taken it. The elder brother [of the shining light] also would come to look for the Tiponi tablets and fulfill the mission given him by the Great Spirit. The Hopi settled in the area now known as Four Corners , where the state lines of Arizona , New Mexico , Utah and Colorado meet. They lived in humble simplicity and the land produced abundant crops. This area is the "heart" of Turtle Island and of Mother Earth, and it is the microcosmic image of the macrocosm of the entire planet. Each Hopi clan perpetuates a unique ceremony, and the ceremonies together maintain the balance of natural forces of sunlight, rain and winds, and reaffirm the Hopi respect for all life and trust in the Great Spirit. It is said that after many years the elder brother might change the color of his skin, but his hair will remain black. He will have the ability to write, and he will be the only person able to read the Tiponi. When he returns to find his younger brother, the Tiponi will be placed side by side to show all the world that they are true brothers. Then great judgment will take place, for the elder will help the younger brother to obtain real justice for all Indian brothers who have been cruelly mistreated by the white man since he came to Turtle Island . Hopi prophecy states that World War III will be started by the people who first received the Light -- China , Palestine , India and Africa . When the war comes, the United States will be destroyed by "gourds of ashes" which will fall to the ground, boiling the rivers and burning the earth, where no grass will grow for many years, and causing a disease that no medicine can cure. This can only mean nuclear or atomic bombs; no other weapon causes such effects. Bomb shelters will be useless, for "Those who are at peace in their hearts already are in the Great Shelter of Life. There is no shelter for evil. When the Saquahuh (blue Star) Kachina dances in the plaza and removes his mask, the time of the great trial will be here." The Hopi believe that only they will be saved. The Hopi also have prophesied that " Turtle Island could turn over two or three times and the oceans could join hands and meet the sky." This seems to be a prophecy of a "pole shift" -- a flipping, of the planet on its axis. The Hopi call this imminent condition -- and that of society today -- "Koyaanisqatsi", which means "world out of balance...a state of life that calls for another way. "